A friend of mine who is not an audio engineer went to a show and later told me it sounded too loud and was unintelligible. Sound plausible? Sure. Now try this: a friend of mine went to a show and said it sounded like the line of the speakers had been broken. Still sound plausible? No? I figure everybody knows what this sounds like since it is such a big issue for discussion. Every time I tune a system or hold a seminar someone tells me all the things I can’t do because I will break the line. Whatever you do don’t break the line because it will sound like…………………. Help me out here… sound like what? I invite you to blindfold me and roll me around the venue. We can listen to pink noise or any music besides Steely Dan. As we move I will use my trained ear to tell you when it gets louder/softer, more reverberant or less, brighter or duller. I can tell you specific peaks and comb filter areas, and even identify transitions between elements of the sound system or the timing and strength of echoes. This is not because I am special – any audio engineer with a trained pair of ears can do this. Similarly you can stuff my ears and put me in a remote room in front of my FFT analyzer and I will be able to identify all of these same features as you move a measurement mic around the room. Admittedly this is not something everyone can do, but with sufficient training and experience you can. The reason is these are objective, verifiable, audible characteristics of the sound system in the space. A 6 dB level difference between two locations is not a theory – it is true or not true. It can be directly experienced and measured. Here is what I cannot tell you by either of the above methods: whether or not the line array theory has been violated and the line is broken. When the line breaks do we hear a snap? Does the frequency response show tear marks? These are absurd questions but please tell me: what are the tell-tale signs? Why is there such widespread fear of breaking the line? The best I can figure is that it is the fear of breaking the party line, as much or more than the acoustical line. There are two principal manifestations of the “Don’t’ break the line” strategy. First is the prohibition of level tapering within a multi-element array. So if it’s 6 dB too loud in the front area (a verifiable fact I can hear and measure) we should not solve this with level tapering because we will break the line (a theoretical construct that I cannot characterize sonically or measure). The second is the prohibition of spatial separation between sections of an array. So when a balcony depth is more than half the hall depth we should not split the array into upper and lower sections (which would have measurably superior uniformity) but rather keep it together to preserve the line. Let’s start with level tapering. Let’s consider a basic arena shape in the vertical plane: Longest throw to the top – shortest to the bottom. Is the relationship of level taper to line breaking a digital phenomenon? i.e. one or zero? Broken or unbroken? If we have 16 identical boxes in a line and they are run at the same level it is assured that our line is unbroken. If one box is down 0.1 dB is the line broken or just slightly bent? If it is broken already I have bad news: You have never heard an unbroken line, because manufacturing tolerances aren’t that good. How about variations of 1 dB? Again, nobody can deliver you 16 boxes that are within a single dB. Let’s step it up: Turn the bottom box down 6 dB. This makes it effectively half a box. The loss in the lowest frequency range (where directionality is so low and wavelengths so large that they sum well) that the combined response is reduced by less than 0.25 dB. This does not seem so scary for the big picture does it? Let’s go further and reduce 3 boxes by 6 dB. The lowest frequencies now lose 1 dB. The high frequencies meanwhile are substantially reduced in the area where the bottom three boxes are pointed – such as the early rows of seats. This is a tangible benefit (up to 6 dB of HF control) for a minimal cost (1 dB loss in overall LF power). Is the line broken now? If so, how can I tell? Is it broken everywhere or just at one place. Is it broken at all frequencies? It should be easy to find the break point at 10 kHz, since there is enough directional control to hear the isolated areas on either side of our fault line. You could find it blind-folded or measure it with an analyzer. Do you think you can identify a break point at 100 Hz? Good luck. These large wavelengths do not turn on a dime. When people talk fretfully of breaking the line is it the VHF range they are worried about? Not from what I hear. The concerns I hear are much more about the lows than the highs. A practical taper is usually more gradual with 1-3 dB steps being more typical and which makes it difficult to locate the transitions in the space. If we tapered the bottom 5 boxes at 3-3-3-6-6 dB we would get an overall LF loss of 1 dB, and gain substantial HF steering. The same price would be paid for a taper of 1-1-1-1-2-2-4-4 dB on the bottom 8 boxes of our 16 element array. These are just two of a myriad of options that can be employed to help tailor the response of our bent/broken system to the shape of the audience. Many experienced engineers have espoused to me the perils of breaking the line. Yet all strive for front/back level uniformity. There is a limit to how much we can squeeze these systems by splay angle asymmetry alone. Once that option has been exhausted and the cluster ain’t coming back down we need to look at how much level disparity is still left. If it’s too loud in front, I vote we break the line and turn down the lower boxes. If you have a better measurable, verifiable method, I would love to hear it. 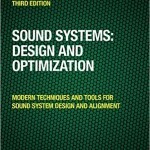 One funny historical aspect related to this subject: 25 years ago when we started bringing FFT analyzers in to tune sound systems, many engineers would deride us. They resisted our use of an analyzer to help make decisions, saying we lived in “theory-world” and that they lived in the “real-world”. Nowadays some engineers still want to limit the actions we perform based on the analyzer but now the problem is that I live in the “real world” and they are in the “theory world.” Funny that one eh? thank you for this! i have long been confused by arguments against level tapering, which always intuitively seemed wrong to me. now i have your clear and concise wording to point to. I enjoy your blog as well. I will have to pick your brain some time to get some pointers on how to run one these things. You have tons ‘o experience with this stuff. At this point I am just throwing stuff at the wall and seeing what sticks, but it’s pretty interesting. I know at least one manufacturer recommend against level tapering due to not wanting the relative levels to change when the system hits limiters (and some boxes limit quicker than others due to the different gains).. Thanks for posting. Interesting point. Let’s think it through. Hypothetical. Let’s say 12 boxes, 6 at 0 dB, 3 at -2 and 3 at -4 dB. Result is even level top to bottom. Top runs out of headroom and begins limiting/compression. Middle and lower section continue undisturbed potentially rising (as individuals) 2 and 4 dB respectively. Since the overall level in the lower areas is an aggregate of all 12 boxes (more so as you go down in freq) the overall level rise would be less than the full 2 and 4 respectively. How much would this affect the area covered by the upper boxes? – not as much as one might think – the HF region should have enough isolation that the upper area won’t hear the HF of the lower boxes. As you go down in freq there could potentially be some resteering due to the level modulation – but as freq falls the ability to radically steer becomes very sluggish. You can taper all day and barely move 200 Hz. But what you say is true – there will be some movement when sequenced compression occurs. Go the other way. Turn them all up to 11 and then run it at 13. It starts off 4 dB louder in the front, 2 dB louder in the middle- and stays that way all the time. Option 1 (Taper): a potential problem at some frequencies at some locations at some times – if the system is overdriven. Option 2 (No Taper): a certain problem at all times in a large freq range at a substantial amount of the locations. Interesting point. I guess we have to choose our poison. I have had several arguments with band foh guys about this as I had used tapering in the array. How do you calculate how much loss there is in the low end or is this amount only known after you measure it? Excellent question. It is precisely because of those kind of arguments that this was posted. It is a response to the SPL Preservation Society. First we assume that the LF responses are so highly overlapped that we will consider them 100% coupled. Here is the math – the trick is you have to convert the log values to linear, then you will see it. So 16 boxes at 0 dB (relative) = 16 x 1 (since a ratio of 1/1 is the linear equivalent of unity). =20*LOG(14.5) converts to 23.23 dB so I was not quite correct when I said you would lose 1 dB. It would be 0.85 dB. Obviously this would be a catastrophe. Much better to have it way too loud in front, don’t you think? Bob, these informations are invaluable !!! I have heard so many times to ‘never break the line’…, now it appears to be clear. VERY VERY THANKS TO TAKE YOUR TIME FOR SHARING YOUR EXPERIENCE WITH US. PEACE. I’ve ever used “level tapering, especially in theaters. I normally develop my line arrays in configurations ABCD, but I found that when I do “level tapering”in the bottom of the array, the arrival of top speakers out of time, tend to match the level with the speakers below the array, as these are lower level, and are no longer so isolated, and find something else comb filter. This gives me doubts and I try to reduce excess energy on the front lines with the angle. Thanks for your comment. I use both angle asymmetry and level asymmetry. Which one could also call angle tapering, and level tapering. My approach is to get as much shaping as I can by angle, and then add level tapering as needed. If I can get it all done with angle that is great, but pretty rare. If it is still louder in front, then I turn down the lower boxes. If the downlobe from the upper boxes is too strong thenI am left with a choice: let it be louder in the front or let the front have combing. I try to find the best balance here. I try to keep the front not more than +3dB level from the main seating areas. This does not sound too much different than you experience. Finally I would like to ask you another question, I use for major events form a line array that has a vertical coverage of 3, obviously the highest frequency that we can reproduce, then in order to have good coverage downfill I use a smaller system in phase compatible with a wider vertical coverage, the lowest power helps me to decrease the level in the front rows, and use a presset manufacturer that uses a delay, since the wave guide is not physically located at the same distance as that of the main speaker. my question is, if I change the level of downfill, should I change the delay, since they are different wave guides. 1) If the HF devices that we are putting together each have a single central exit then it is a good candidate for delay taper. e.g radial horns. This works because the acoustic centers of the two devices are pretty far apart, and the transition point falls a long (relatively for these wavelengths) distance between them. 2) If the HF device is a multi-exit waveguide/ribbon emulator type device, where the exits are spread in a straight line from edge to edge of the cabinets then this a POOR candidate for delay taper. Why? Because transition is edge-to-edge, not center-to-center so the timing issue, even with a level offset is TINY. One could make the theoretical argument that delay taper still has merit but the timing change would be VERY small, in my experience in the .02 or .04ms range and not worth the trouble. Thanks for your answer, I know, thanks to many of your explanations that we do not need to compensate with delay when we do a level adjustment between speakers with wave guide of the same model, but I understand that when two speakers are not the same size, and Therefore their wave guides are not physically aligned, they should use any delay to prevent comb filtering. From this reasoning, I got the question. I’ve been investigating a bit more and curiously I found on this system in the x-over acoustic cancellation problem exists in the range 500 Hz, where the vertical coverage is 90 degrees in the small speaker and somewhat less in the major. The DSP uses filters F.I.R. and group delay is identical for both speakers, then I can not understand why the cancellation occurs, unless that although the group delay is identical, the different physical position of the transducer to create the problem. I am sorry if I misunderstood your question. Certainly if the speakers are unmatched then delay is in the game. If one speaker has a mechanical head start we will make it wait. Now my question back to you. Where do you see this cancellation on the large speaker? In front of one driver, or along the plane where you are equidistant between the two drivers involved in the XOVR? excuse my English, it is difficult for me to express myself well in your language. Basically the problem I find is both the acoustic predictions and the measurements, a large cancellation about 500 Hz, the axis of the down-fill speaker, I understand that the x-over acoustic is moved towards lower-level speakers (downfill). In all other frequencies the result is correct. So my question is always, why? So I think, if the group delay is identical, then the problem must be that the main arrangement comes out of time and with a similar level to that of the down-fill and that is why the cancellation occurs, I understand that it only occurs in range of about 500 Hz and the higher frequency does not occur. I think this is because the speaker has a narrow directivity proportional vertical coverage. And yes- it makes sense that as freq rises we get directional control and so the cancellation does not continue. If you want to send me data to look at – I will be happy to see it. Pepe: I looked at your blog – very nice – is it OK if I link to it here? Unfortunately I deleted my acoustic measurements, it is easy to re-take the predictions, but it is only possible with a resolution of 1 / 3 octave. I am a newbie in the “blog”, but born with the idea of being a meeting point for friends who like to talk about sound. Of course would be our honor.